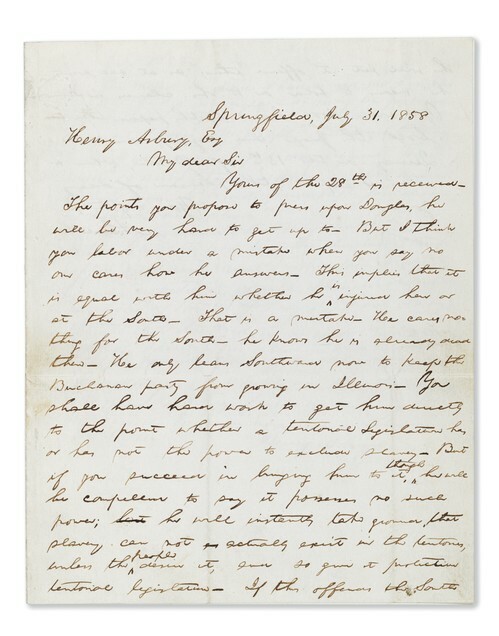 the letter outlines how Lincoln intended to debate whether a territory had the right to exclude slavery even in the wake of the Dred Scott v. Sandford Supreme Court case stating that Congress did not have the authority to prohibit slavery in U.S. territories. A recent convert to the Republican party after the collapse of the Whigs, Asbury had previously written to Lincoln on July 28 with suggestions for the second of seven debates with Douglas. “Do not let him [Douglas] dodge here,” exhorted Douglas. Lincoln’s response, dated July 31, agrees with Asbury’s tactic to force Douglas to clarify his position on slavery, which in turn alienated Douglas from southern voters. Though Lincoln lost his senate bid, the debates catapulted him into the national political consciousness. The resulting splintering of the Democratic Party gave Lincoln the necessary majority votes to become America’s sixteenth president in 1860. Pre-sale estimates on this document fall between $500,000-700,000. 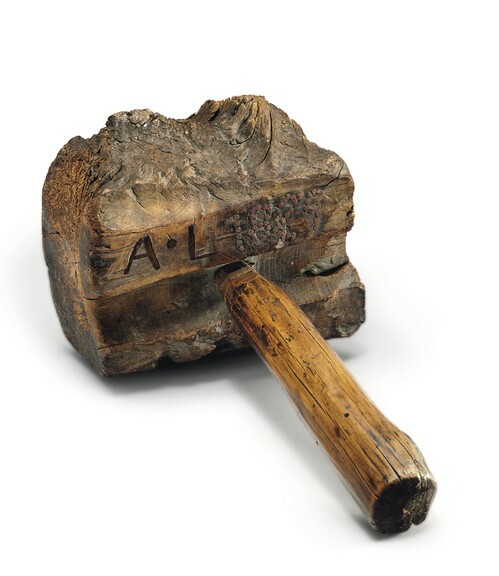 Offered in the same auction: a wooden bench mallet bearing the initials “A.L.” that is believed to be the earliest artifact belonging to Lincoln in a private collection. Fashioned from a broken rail-splitting maul, Lincoln used the mallet when he lived in Pigeon Creek, Indiana, from 1816 through 1830. The maul is crafted from a cherry wood burl with a hickory handle. The mallet came into possession of Lincoln’s Pigeon Creek neighbor, Barnabas Carter, Jr. in 1829 or 1830, and has remained in the family until now. Pre-sale estimates range from $300,000-500,000. A recent convert to the Republican party after the collapse of the Whigs, Asbury had previously written to Lincoln on July 28 with suggestions for the second of seven debates with Douglas. "Do not let him [Douglas] dodge here," exhorted Douglas. Lincoln's response, dated July 31, agrees with Asbury's tactic to force Douglas to clarify his position on slavery, which in turn alienated Douglas from southern voters. Though Lincoln lost his senate bid, the debates catapulted him into the national political consciousness. The resulting splintering of the Democratic Party gave Lincoln the necessary majority votes to become America's sixteenth president in 1860. Offered in the same auction: a wooden bench mallet bearing the initials "A.L." that is believed to be the earliest artifact belonging to Lincoln in a private collection. Fashioned from a broken rail-splitting maul, Lincoln used the mallet when he lived in Pigeon Creek, Indiana, from 1816 through 1830. The maul is crafted from a cherry wood burl with a hickory handle. The mallet came into possession of Lincoln's Pigeon Creek neighbor, Barnabas Carter, Jr. in 1829 or 1830, and has remained in the family until now. Pre-sale estimates range from $300,000-500,000.